Gavriel (B) has donated another $52 for the spread of nanach. 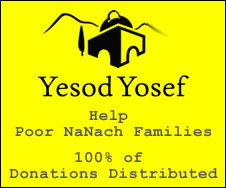 I know that everyone likes Simcha Na Nach, he has also helped us and he has got many good points (nekudot tovot) but our friend has fallen and we must help him. Whoever really has mercy on Simcha Hochman and is pained by the situation that he has fallen to, please to PRAY for the healing of his neshamah, to say a lot of Na Nach for him, to consecrate a few minutes for him during Hitbodedut, to ask at Saba's tziun to have mercy on him. It would be a pity that our friend should fall to Sheol Tachtios because the Yetzer Hara has gradually tempted him to become a mefursom. Simcha ben Chavah Brocha for a Refuah Sheleima.